Are you sure you want to remove The practice of piety from your list? Manitowompae pomantamoonk sampwshanau Christianoh: uttoh woh an pomantog wssikkitteahonat God. The practice of piety: Directing a Christian how to walk, that he may please God. Amplified by the author. Microform in English - The LXXI edition. The practice of piety: directing a Christian how to walk that he may please God : amplified by the author. 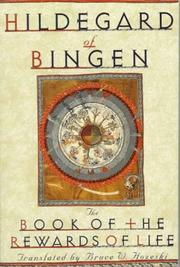 in English - The sixtieth edition. - The sixty-second edition, corrected. The practice of piety: directing a Christian how to walk that he may please God. Amplified by the author. Microform in English - The sixtieth edition, corrected. Microform in English - The fifty-ninth edition, corrected. 1728, Printed for Alford Butler, at the lower end of King-Street, near the Crown Coffee-House. Microform in English - The fifty third edition, corrected. Microform in English - [The 54th edition]. 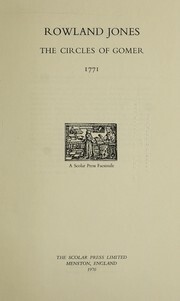 1718, Reprinted by B. Green, for Benj. Eliot, and Daniel Henchman. Sold at their shops. Microform in English - The fifty first edition, corrected. 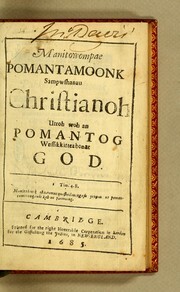 Manitowompae Pomantamoonk Sampwshanau Christianoh Uttoh woh an Pomantog Wnssikkitteahonat God. 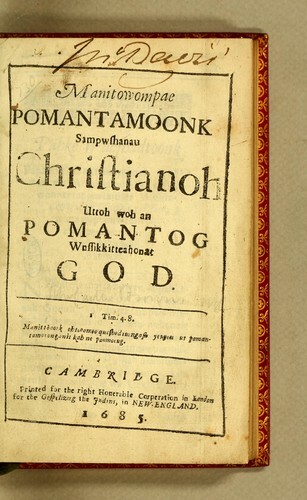 Manitowompae Pomantamoonk Sampwshanau Christianoh Uttoh woh an Pomantog Wussikkitteahonat God. The practice of piety: directing a Christian how to walk that he may please God. in English - The last edition. Microform in English - The last edition. The practice of piety: directing a Christian how to walke that he may please God. The practice of piety: directing a Christian how to walke that he may pleise [sic] God. Amplified by the author. 1637, Printed [by J. Legat?] for Andrew Crooke ..
1636, Printed by R.B. for R.A.
Microform in English - The 36. edition. The practice of pietie: directing a Christian how to walke that he may please God. Amplified by the author. Microform in English - The last and most corrected edition. Newly overseene and corrected. Microform in English - The last edition, newly overseene & corrected. Microform in English - The last edition. Newly overseene and corrected. Microform in English - The last and most corrected edition, newly overseene and corrected. Microform in English - The 35. edition. Microform in English - The 31. edition. Microform in English - The 28. edition. Microform in English - The 27. edition. Microform in English - The 25. edition. Microform in English - The 23. edition. Microform in English - The 20. edition. Microform in English - The 15. edition. Microform in English - The 14. edition. The practice of pietie: directing a Christian how to walke that he may please God. Microform in English - The thirtenth [sic] edition, profitably amplified by the author.